YOU MAKE HAPPINESS FLOW! Celebrating 10 years of protecting water! Please help spread awareness and your passion for our environment to make our goal a success. Together we touch the lives of tens of thousands of families worldwide. 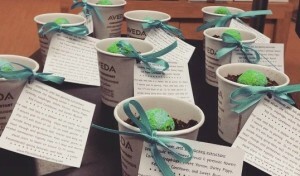 Earth Month funds raised by the Aveda network supported clean water projects & programs that support children. Since 2007, you have helped the Aveda Network raise $38 Million! Let's gather as a community to make a real difference for clean water, because when you protect clean water, you protect what you love; animals, kids, our environment, everything! April is Earth Month and we make it easy to treat yourself while helping protect the things you love. This year we are offering Appointments for Clean Water. Choose from our Earth Month menu of services, all proceeds will benefit Clean Ocean Action. SSS Signature Scalp Massage - $1 per minute SSS Chair Massage - $1 per minute Makeup Touchups - $5 Aveda Deep Conditioning Treatments - $5 Beauty On Demand Services - $15 ALSO� We put together small seed globes in organic soil. Did you know that without bees we wouldn't have 80% of our flowering crops. Read our easy tips to help save our bees here. � � � JOIN US for our other Earth Month events & projects. April 4th- April 16th - Local businesses partnered with us to raffle some amazing items. April 2nd & April 10th - Stop into our Bake Sale when the SSS team puts some sweet tooth skills to use. April 4 - 30th: Year of Blowout's Raffle** April 18 - 30th Win a Free Haircut raffle April 10th: CUT A THON and Beyond plus... Bake Sale April 16th: Local Bees Day � **Blow-Dry's for a Year winner receives a Wash and Blow-dry Max 1 per week for one year. To be booked with Fresh Talent or Senior Stylist only. Non-transferabe. Tips not included. Every $30 donation enters you into the drawing.